Q. 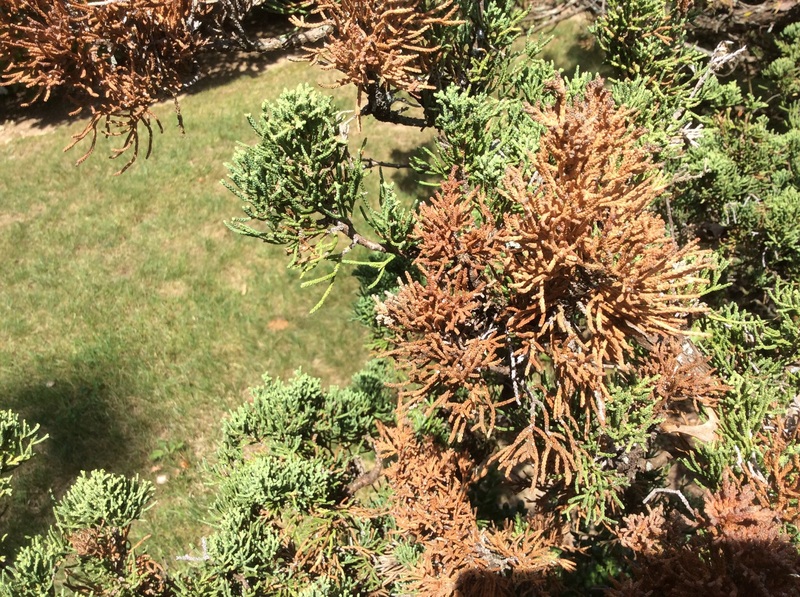 Can you tell me how to treat my juniper trees for cedar apple rust? I have 3 robust juniper trees that are about 25' tall and about 30 years old. For the past 3 or 4 years they get the rust disease that is caused by a apple tree ( I do not know where the apple tree is ). The junipers are not looking very good dead drown patches at the ends of many branches, dried milldue branches and healthy new growth. I do not want to remove this trees since since they are placed in a triangle patern blocking and entrance to the back yard. I have shared your image below. Are you looking for ways to treat the rust? This guide from the University of Minnesota offers some starting advice: http://www.extension.umn.edu/garden/yard-garden/trees-shrubs/cedar-apple-rust-and-gymnosporangium-rusts/.